Krysten Ritter’s curmudgeon hero Jessica Jones returns for a second season. Marvel’s Jessica Jones returns to Netflix for its sophomore season tomorrow but the high expectations that come along with it were met with an unfortunate whimper. 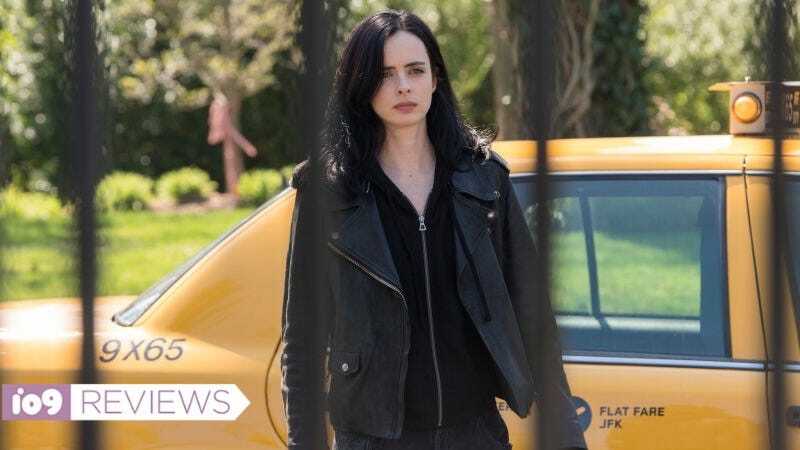 Netflix provided the first five episodes of season two as a preview, and while Jessica (Krysten Ritter) is back to business at Alias Investigations after the events of season one, she’s not back to form. The drama, the stakes, and hell, even the jokes are all lessened, which makes for a dull, meandering watch, but it’s almost immediately clear why season two isn’t holding up to expectations. There’s a villain problem, mainly that there isn’t a direct antagonist provided for Jessica at the start (besides Jessica’s own mind, of course). I remember feeling incredibly uncomfortable as the first season progressed, thanks to its very powerful, very evil villain, Kilgrave (David Tennant). To top it off, anyone could become a “villain” under his control. Jessica could never really know when she was going to be confronted with another foe, which made for some really dramatic, dynamic episodes. But when we meet up with her in season two, she’s back to taking cases as a private detective—with some help from her neighbor Malcolm (Eka Darville)—and not much else, though the prospective clients are taking a toll. People expect Jessica to be a “hero” but, especially after murdering Kilgrave, that’s not how she sees herself. She’s still haunted by the event, despite having no choice at the time. And certainly that’s one of her biggest problems. Despite her powers, Jessica has never felt in control. From the accident that killed her family, to the shady circumstances that led to her getting powers and Kilgrave’s horrific treatment of her, she’s in need of some introspection. Jessica is “dealing” with her problems in the trademark Jessica fashion (read: unhealthy) but her reactions are perhaps a bit too on the surface to have a real impact on the audience, especially after the way season one dealt with similar issues. What Jessica Jones is going for is good and makes sense for the character, it’s just not the most interesting thing to watch, especially when there’s not much else happening in the overall story. The season dives into Jessica’s past which is not just cloudy for viewers, but for Jessica as well, and it’s a really slow burn. I’m sure it will get somewhere eventually but again, in the first five episodes, there’s just no real sense of urgency here. Jessica and Trish join forces to intimidate the patriarchy this time. Though there are some very emotional moments for Jessica, the biggest strength of season two so far is the promise of what’s to come for the supporting characters. While new character Pryce Chang (Terry Chen) is an excellent example of masculinity gone bad, he gets old quick. It’s Jessica’s extended family that really picks up the slack. Malcolm has the opportunity to get back to helping people and make up for the damage he feels he caused previously, even if he wasn’t in control of himself. Trish Walker (Rachael Taylor) is trying to take a more active role in heroics as well but is skating a fine line while trying to keep up with Jessica. And then there’s the hard-edged lawyer Jeri Hogarth (played by Carrie-Anne Moss), a complicated character who becomes even more complicated in season two. I’ll be very interested to see how viewers react to a slight course-correction for her, but what I’m really hoping for would have much larger implications for the Marvel Cinematic Universe going forward. If only Netflix has the guts to do it. Jessica Jones starts streaming on Netflix tomorrow, March 8, which is also International Women’s Day, for the record.